How Astrologically Compatible Are Meghan Markle and Prince Harry? (September 15th 1984 4.20 pm Paddington, London). Harry is incredibly earthy with his sun and Mercury in practical, astute Virgo, moon in stable Taurus and capable Capricorn rising. He was born when the moon was in the same position of the skies as his mother Diana’s Venus sign (just 3º apart), impressing an important connection with his roots and strong ties to home. The position of Saturn in his horoscope suggests he feels the weight of his reputation in the world – and its considerable power. (August 4th (like the Queen Mother) 1981 4.46 am Canoga Park California). With her sun, Mercury and her destiny driven north node shining brightly in Leo, the Royal Family is a suitable setting for Meghan, equivocal to her successful career on camera. The TV star was born with compassionate Cancer rising, coloring her immediate response to the world with a sensitive shyness and great empathy; this ascendant sign also reflects the character traits of Cancerian Princess Diana, Harry’s late mother. Sweet Libra is a dominant constellation in Meghan’s personal horoscope, with her birth chart ruler (the moon) in the sign of the scales, firmly established in the home and nesting zone. Protective, loyal, with the potential to be wildly assertive, Mars is positioned in an understated – and discreet – area of the chart, fabulous for keeping private matters well hidden. In contrast to Harry’s grounded personal placements, Venus is the only planet found in an earth sign: refined Virgo. While the couple have neighbouring sun signs (Leo / Virgo), their personal horoscopes prove opposites attract, as their rising signs occupy the two sides of the Cancer-Capricorn axis. They perfectly mirror and place each other in their respective partnership – and marriage – zones! Aligning their two charts shows an important connection between his moon, her visionary Neptune and seductive Pluto, and the noteworthy asteroid ‘Chiron’. This relationship can enhance both their sense of security, and prove deeply healing, with great emotional understanding and connection between them. There’s no doubt he’s drawn to her powerful allure – and perhaps even the glamorous nature of her work! They truly compliment each other, with Meghan’s loving Venus positioned between Harry’s sun-Mercury in Virgo, and Harry’s Venus nestled among Meghan’s Libra planets. Harry’s abundance of earth provides Meghan with stability, while Meghan’s Mars in Cancer is exactly on Harry’s Descendant – so that he’s absolutely attracted to her passionate side. The couple are confirmed to be wed on May 19th at Windsor Castle, when the moon will be sailing through sentimental Cancer – hankies at the ready! A marriage made in Taurus season, the quality of the union will be enduring, breeding security in both but particularly putting Harry’s Taurus moon at ease. Romantic Venus will sparkle at the last degree of Gemini, adding a sociable air to the day and lots of spirited action from the people in the crowd! It promises to be a fairy-tale affair, with faith inducing Jupiter and Neptune in water signs, aligning beautifully with the moon. Enjoy the beautiful side of life, and retreat regularly in private. With the pair’s Venusian moon signs (Taurus and Libra), the couple will be at home in gorgeous surrounds, so should set up camp in one of the more comfortable castles or perhaps a country manor: Highgrove, which Diana adored. With planets in service-oriented Virgo the pair will be eager to take on dutiful roles, diplomatic, charming and at ease together in the spotlight with their blend of Libra and Leo. Meghan can make the most of her Cancer rising by working for causes connected to children and mothers, while Harry will be coming into more responsibility as Saturn crosses his ascendant at the end of 2018. This article also appears on horoscope.com. 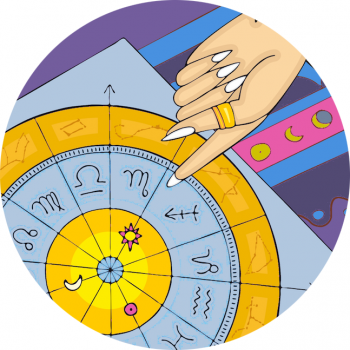 Pick The Perfect Wedding Date Using Astrology!